Borderlands 3 cross-platform multiplayer, AKA cross-play, is not a confirmed feature - despite some leaks. But it could still happen! Borderlands 3 publisher 2K Games revealed in a statement to GameSpot that it's investigating the possibility of Borderlands 3 players teaming up no matter what system they play on, potentially following the lead of other multiplayer games like Fortnite and Rocket League. "Cross-play is something we're looking at closely, but we don't have anything to confirm or announce at this time," a 2K representative said. This follows the discovery and subsequent removal of a cross-platform support feature in the Microsoft Store listing for Borderlands 3. That bullet point appearing in just one spot indicates it was a mistake, but it could also have been a premature reveal for a feature that Gearbox and 2K are holding back to announce later. Borderlands 3 cross-platform multiplayer would be perhaps the biggest step Gearbox could take in modernizing the series (even moreso than its co-op scaling system that gives everybody appropriate challenge and rewards). Friends being unable to play the same damn game together just because they're on different consoles is starting to feel like some dark-ages BS and our bright cross-play future can't come soon enough. 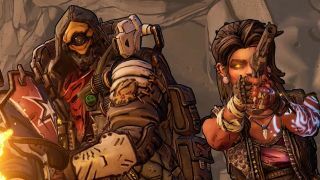 Even if Borderlands 3 doesn't launch with cross-platform multiplayer when it arrives on September 13, it could always add the option in later. As long as you can link up with all your buddies and compare insult-spewing guns at some point, I'll be happy. Think you know the score on your next lootin' shootin' adventure? Check out 14 details you missed in the new Borderlands 3 trailer, or watch the video below and see what the secret codes in the first Borderlands 3 teaser mean.